At 2015 OLED Evaluation Seminar (December 4) hosted by UBI Research, UBI Research’s president Choong Hoon Yi gave a talk titled AMOLED Panel Industry Trend and Market Forecast discussing OLED industry until 2015 and forecasting 2016 OLED market. Yi presented 2 issues related to flexible OLED. The first issues he discussed was regarding foldable types in foldable display. Yi explained that in-folding is where display is placed inside and out-folding has display on the outside, and revealed that in-folding type is mainly being developed. He also added that these technologies will be useful in FinTech (financial technology: new form of financial technology using mobile, social network, big data, etc.). According to Yi, another issue for flexible display is film application. In order to increase the yield of flexible display, film has to replace cover glass. However, this could lead to unpleasant touch sensation and Yi emphasized technology such as polishing has to be applied to improve this to convince the consumers. Regarding the market, Yi estimated that the total global smartphone market will grow to record approximately 2,000 million units until 2020, with Samsung Electronics’ 400 million units. He also estimated that the OLED display proportion of Samsung’s Galaxy series will continue to increase and that most of Galaxy products will have AMOLED panel in 2019. Of this, Yi announced that flexible OLED and rigid OLED are to record approximately 280 million units and 120 million units respectively. He also forecast that the OLED TV market will grow into approximately 11 million units and that materials and equipment companies will rapidly grow. 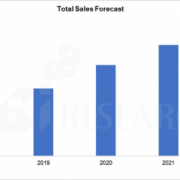 At present, the display market is entering low growth state, and companies are focusing on strengthening the market competitiveness through new technology development and production potential increase. 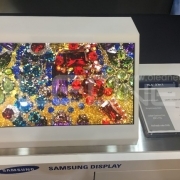 Samsung Display is actively striving to increase OLED panel’s supply for external companies. LG Display announced 1.84 billion KRW investment for world’s largest OLED focused P10 factory and other areas. Yi reported that as flexible OLED evolves, the mobile display resolution competition of the present will disappear, and he estimated that as LTPS-LCD market decreases, the sales of related panel companies, such as BOE, Sharp, JDI, and LGD, will diminish. Yi also told the audience that he is expecting Samsung Electronics to put OLED TV on the market from 2018 and the sales of the companies, Sharp, AUO, and CSOT, that were supplying them with LCD panels will fall. Essentially, he explained that as the OLED market grows, LCD dealing companies’ position will weaken which will lead to the strengthening of OLED panel production and related companies’ position. When asked about the future of Korean display panel companies, Yi replied that when LCD and OLED are competing, set companies decides the market. However, if OLED can unite the market, Yi emphasized that the display panel will be rebranded as Rule Maker and LG Display and Samsung Display will be in its center. http://jpn.olednet.com/wp-content/uploads/2015/12/대표님.png 705 940 OLEDNET http://jpn.olednet.com/wp-content/uploads/2015/09/logo_oled.png OLEDNET2015-12-08 16:39:032015-12-17 16:57:30[2015 OLED Evaluation Seminar] Can LG Display and Samsung Display Become OLED Market’s Rule Maker?